Joey D's Jerky is a brand of DiSalvo Enterprises, Inc., based out of Sanford, FL. The brand launched in August of 2008. It's the creation of Joseph DiSalvo, who started making jerky at home in 1999 with a small dehydrator. He and his friends would compete against each other to make the best beef jerky. Eventually his friends saw DiSalvo's potential for commercial success, which spurned him to make a career change. The Joey D's brand also includes a line of salsas of DiSalvo's own recipes. The company has four varieties of jerky, this Original, a Teriyaki, a Hot, and a Tangy, all of which are manufactured in its own USDA approved facility. Beef, soy sauce, worcestershire sauce, brown sugar, flavorings, salt. The first thing I taste from the surface of these pieces is a light saltiness, a faint sweet, a bit of tangy flavor, and a saucy flavor. There's a faint meaty aroma as well. Overall, the surface flavor has a moderate intensity. The chewing flavor starts with a light natural meat flavor, and then a light black pepper flavor comes in. I think the primary flavor of this jerky, at least on a single piece basis, is a combination of that saucy flavor and the light natural meat flavor. While the ingredients list shows soy sauce and worcestershire, those two are not really well defined in this flavor. I can taste traces of their uniqueness, but it largely takes on a weaker, or more watered down flavor, one that I can only describe as a "sauce" type flavor. Meanwhile, the natural meat flavors, are light, yet still noticeable enough to compete against that saucy flavor for my attention. It seems to have more of a cooked flavor, very much like a well-done cooked steak. But over several pieces, that black pepper flavor builds up strength, and its aftertaste overpowers the lighter saucy and natural meat flavors. The saltiness seems to be at a moderate level. 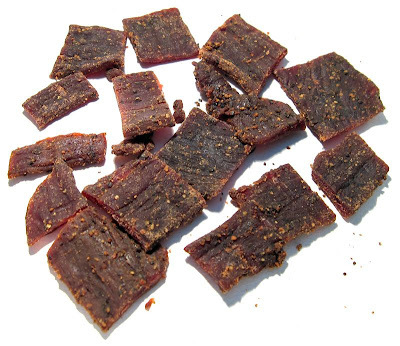 Overall, this jerky seems to have a flavor comparable to well-done cooked steak, with a light natural meat flavor, peppery, and a bit of a saucy flavor, as if just a light dab of sweet steak-sauce had been added. The black pepper will start off with just a light flavor, but builds up strength over several pieces. It's a semi-moist jerky, and quite soft and tender. Tearing a piece apart with my fingers is not necessary due to its bite sizes, but is still very easy to do. Chewing is also very easy. The chewing texture starts out feeling soft and moist, and breaks apart quite easily with just a little bit of sucking and light biting. Once it's chewed down to a soft mass, it resembles a steak-like chewing texture, but not totally. There's a bit of mushiness to it, and even a slight crumbly texture, but yet still enough of a steak-like chewing. These pieces appear to be very lean, I don't find any visible signs of fat, no tendon, gristle, and no stringy sinews. In terms of clean eating, my fingers pick up some fine powder, perhaps black pepper. The small bite sized pieces mean no tearing required, and thus no tiny fragments flying off. For general jerky snacking purposes, at the $2.14 price per ounce, this jerky seems to provide a decent value. I get a lot of snackability for its good overall flavor, and easy eating. That $2.14 price per ounce is higher than the mass-market brands you'd buy at the grocery store, but you're getting a lot better flavor. 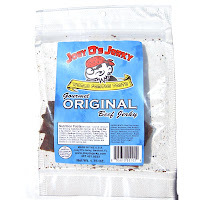 This Original variety from Joey D's Jerky provides a light-to-moderate flavor intensity, consisting of a light "saucy" flavor and a light natural meat flavor. The black pepper is faintly noticeable on a single piece basis, but builds up a decent strength over several pieces, and its aftertaste eventually overpowers the other flavors. 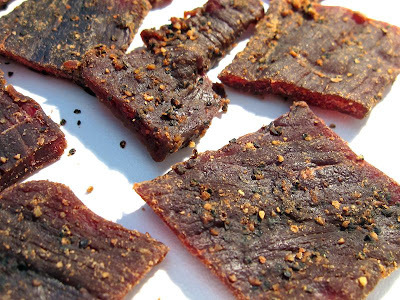 It's a very easy jerky to eat in that it's cut into bite sized pieces, it's semi-moist, and quite soft and tender. It's chewing texture is somewhat steak-like, in that it has some of that grilled steak feel, but yet it's also mushy, and crumbly at the same time. Overall, the flavor reminds me of a well-done grilled steak, with a fair amount of black pepper, and a touch of sweetened steak sauce. I didn't assign it the higher "best" rating because I didn't get that "wow" factor, and the chewing texture was lacking. Otherwise, it's very tasty, and very snackable. A good beer with this is a brown ale.